How to clean your makeup brushes like a pro. Expired makeup and unclean makeup brushes can mess up your skin before you can say ‘Oh no!’ So be aware of when you bought your makeup and make sure you do not use it after the expiry period. Similarly, unclean makeup brushes can wreak havoc on your skin, and we have all been guilty of putting off washing our brushes. We cannot stress the importance of regular cleaning of makeup brushes, even if you are lazy AF. Here we give you the low-down on how to clean your brushes, so your skin and you can thank us later! 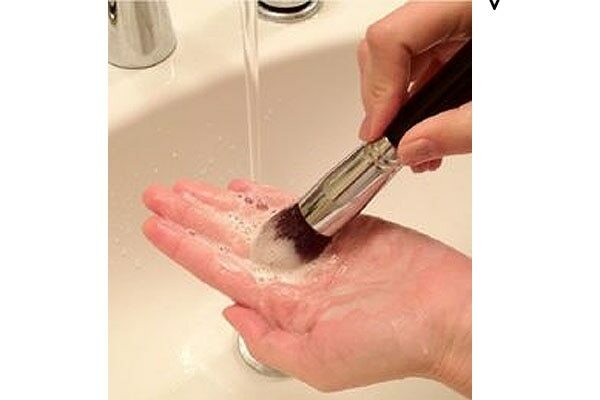 Hold your brushes under running water until they are soaked. This will loosen up any collection of makeup that has hardened on top of the bristles. Cleanse it with a mild shampoo or liquid brush cleanser Squirt a coin sized amount of the shampoo or the cleanser on your palm. Gently swirl the bristles of the brush on your palm to work up a little lather. Rinse the brush with water and repeat this process till you feel all the makeup has been removed from the brush and the water runs clean. Rinse your brush again under running water to wash off any remaining cleansing solution or shampoo. Once your brush is all clean, keep it on a dry cloth and let it air dry. Reshape the bristles when your brush is half-dry. Lay it down flat, or hang them upside down on a hanger (like you would do your clothes and fix them with elastic bands) when it is drying so the water does not re-enter the handle.